Stylize your bedroom with an intriguingly timeless expression with this beautiful wooden armoire. 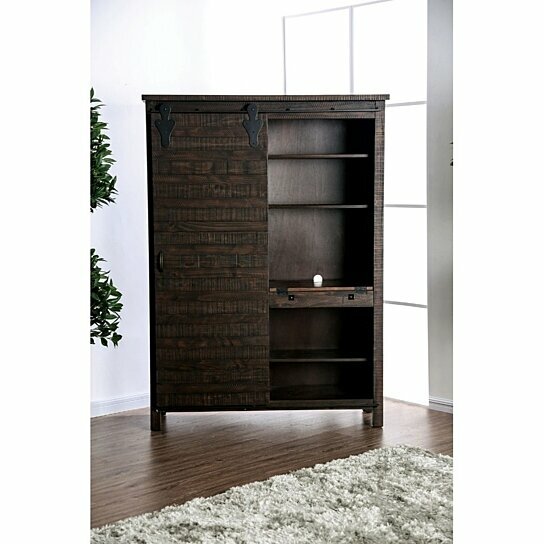 Made up of wood and metal, this armoire features sliding door which provides closed and dust free storage. It also features shelves and spacious storage to your clothes and other stuff. This armoire also accented with natural wooden texture providing a great look. Featuring an espresso brown finish rough sawn texture, this armoire will instantly exude an elegance to your bedroom interior. Made up of durable wood and metal that provide long usage. Perfect to be place in your bedroom for extra storage.